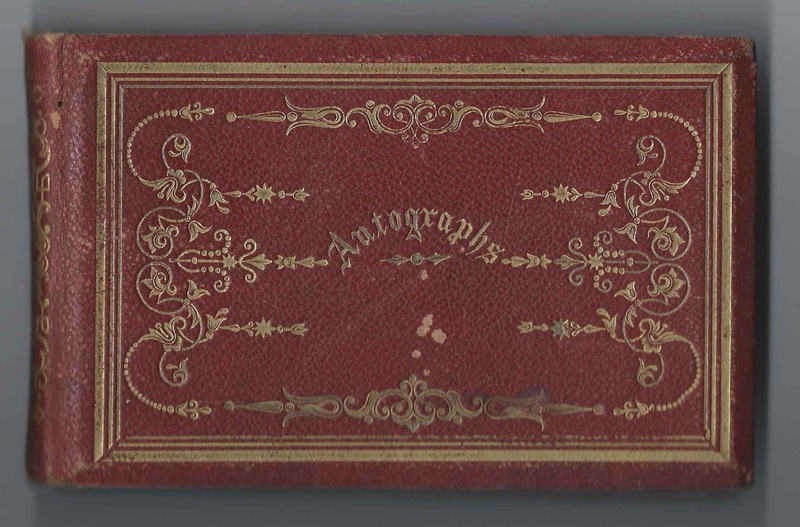 1870s autograph album of Stiles Ashbel Crandall of Mystic, Connecticut. Stiles Ashbel Crandall evidently went by the name Ashbel or Ashy, at least during this period in this life. 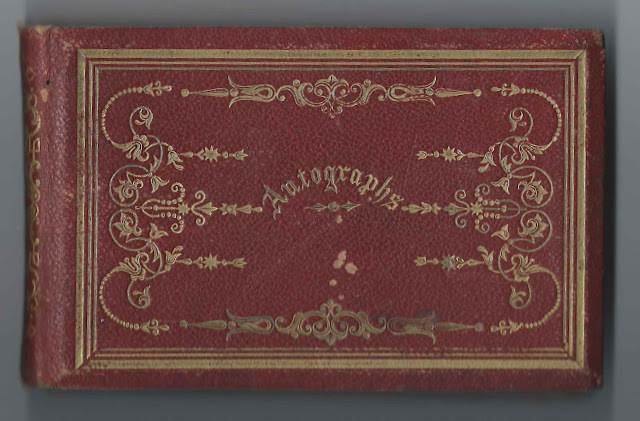 See another post that features the 1880s-1905 autograph album of Stiles Ashbel Crandall's mother, Caroline Lydia (Greene) Crandall. Ashbel's album contains many pages signed by his fellow students at Connecticut Literary Institute at Suffield, Connecticut, now known as Suffield Academy, and by three fellow students at the State University of Iowa, where he later studied law. 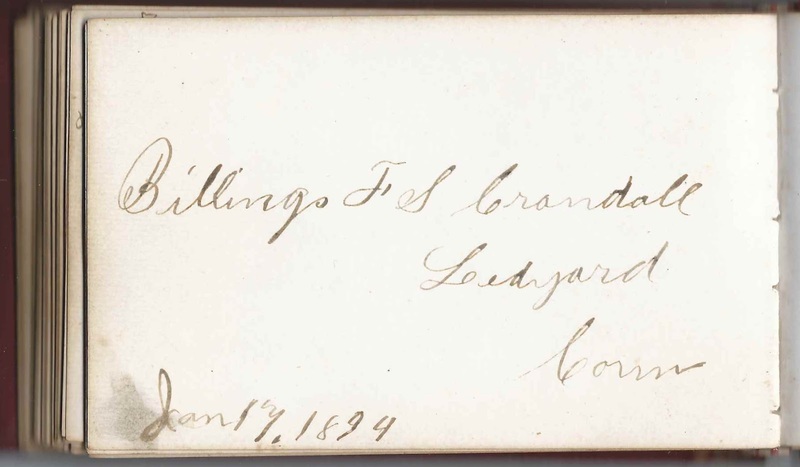 The album is approximately 5-3/4" x 3-1/2" and is rather thick for its linear dimensions. It contains the sentiments of over 100 of Stiles Ashbel Crandall's relatives, friends and schoolmates. An alphabetical list of the signers appears at the end of this post. Stiles Ashbel Crandall was born 12 October 1851 at Ledyard, Connecticut, the son of Stiles Woodbridge Crandall and Caroline Lydia (Greene) Crandall, who were born at Groton, Connecticut, and Stonington, Connecticut, respectively. 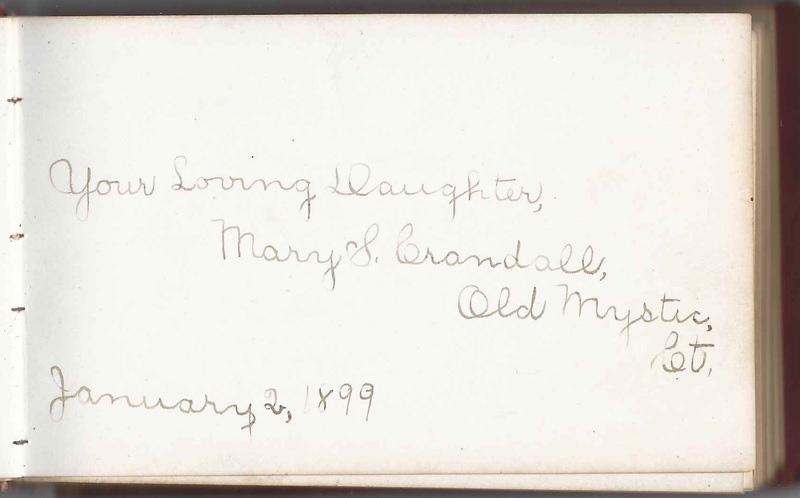 Both children signed pages in the album, when it apparently came to light in a later era.l, Mary Stoddard Crandall in 1899 and Billings Francis Stoddard Crandall in 1894. Sadly, Mary (Stoddard) Crandall died within days after the birth of Billings Francis Stoddard Crandall. I don't believe that Ashbel remarried. After a stint of teaching, Stiles Ashbel Crandall studied law at the State University of Iowa, from which he graduated in 1878. He set up his practice at Norwich, Connecticut. In 1893 he served in the Connecticut State Senate and ran for lieutenant governor in 1895. He was a Mason and spent the last year of his life in the Masonic Home in Wallingford County, where he died. Find more information and a photograph of Stiles Ashbel Crandall here. If you have corrections and/or additions to the information above or information on any of the signers listed below, please leave a comment or contact me directly. Thanks! N. Avery of ? Bridge, Connecticut, signed on December 6, 1872; Poqronoc? Pogronoc? 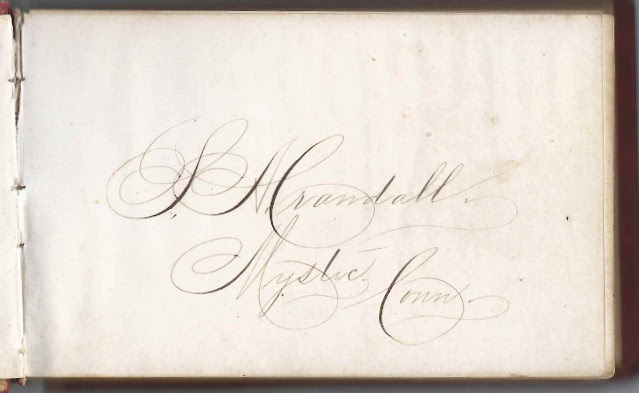 George Brown of Washington, Connecticut; middle initial might be T.
S. A. Crandall of Mystic, Connecticut; Stiles Ashbel Crandall, album owner. He went by Ashbel or Ashy, at least during this period. James Greene of Savannah, Georgia, signed on September 29, 1881; perhaps related to Ashbel's mother Caroline Lydia (Greene) Crandall. 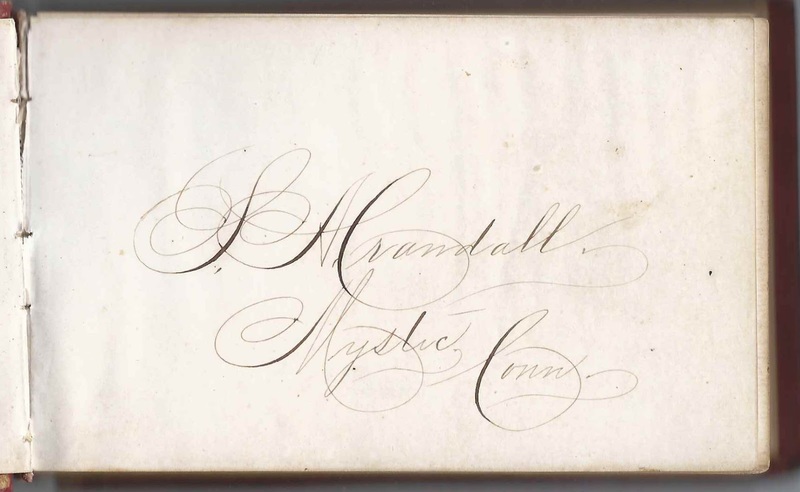 Edmund Halladay of Suffield, Connecticut, signed in Spring 1871 at Connecticut Literary Institute; " 6 ft 3 in"
Myron W. Kinney of Washington, Connecticut, signed on October 1, 1870; Class of 1872, presumably at Connecticut Literary Institute, as he mentioned a group that other C.L.I. students mentioned. E. ? McGurie of Ledyard, Connecticut, signed at Ledyard on August 26, 1874. Not sure of surname. Arthur Middleton of Brooklyn, New York, signed November 7, 1870 at Connecticut Literary Institute. "Remember the box in Latin that came from Brooklyn"
Lizzie Pickett of Waterville, Connecticut, signed in 1870 at Connecticut Literary Institute; middle initial might be T or L or S or ?